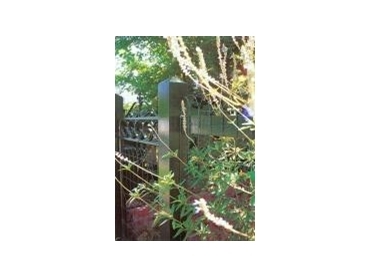 Woven Wire can offer a solution to the need for a front or side fence, gates, ornamental garden border, garden barrier against dogs or even rabbits (New Green Rabbit Wire). Rolls of Woven Wire are 25 metres, however you may order any length of wire, no order is too small. Woven Wire can deliver their fencing door to door. Construction notes are freely available for easy installation. Woven Wire supply and deliver to anywhere in Australia. Woven Wire features the patented DT Plast coating - a unique baked on finish: the benefit is that the wire maintains its colour and doesn't peel or crack. Woven wire started its life in gardens and on fences one hundred years ago. For a time it disappeared. Now it’s back. It used to be overly thick, inflexible, difficult to use and exhausting to paint. Not any more. Woven Wire have reduced the over-thickness, made it flexible and easy to use. There's no painting because the anti-rust (galvanised) inner core is coated through a unique patented process called DT Plast; this coating is adhered to the wire. Ornamental Woven Wire is the preferred choice of heritage architects, landscapers, councils and enthusiasts of cottage and traditional gardens. Protects gardens yet allows plants to grow through. Long lasting patented coating reduces cracking and peeling. Ultra violet stabilisers reduce fading.